Trump tweets: "Trade wars are good, and easy to win"
WASHINGTON (Reuters) - A day after announcing steep tariffs on imports of steel and aluminum, U.S. President Donald Trump tweeted on Friday that "trade wars are good, and easy to win". 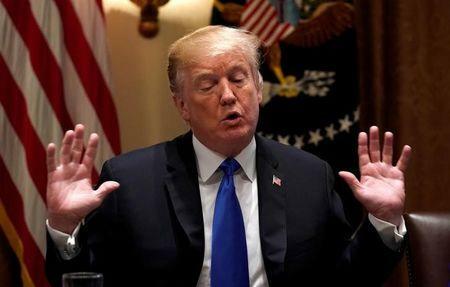 Trump said on Thursday that the United States would apply duties of 25 percent on imported steel and 10 percent on aluminum to protect U.S. producers, although White House officials later said some details still needed to be ironed out. "When a country (USA) is losing many billions of dollars on trade with virtually every country it does business with, trade wars are good, and easy to win," Trump's tweet read. "Example, when we are down $100 billion with a certain country and they get cute, don’t trade anymore-we win big. It’s easy!" Fears of an escalating trade war triggered selloffs on Wall Street and in Asia and Europe, hitting the share prices of steelmakers and manufacturers supplying U.S. markets particularly hard. Trump believes the tariffs will safeguard American jobs, but many economists say the impact of price increases for users of steel and aluminum, such as the auto and oil industries, will destroy more jobs than curbs on imports create.